In follow up to my earlier post, I just found out that Sleipnir's "mother" was the shapeshifting Loki (who attened my first blót). 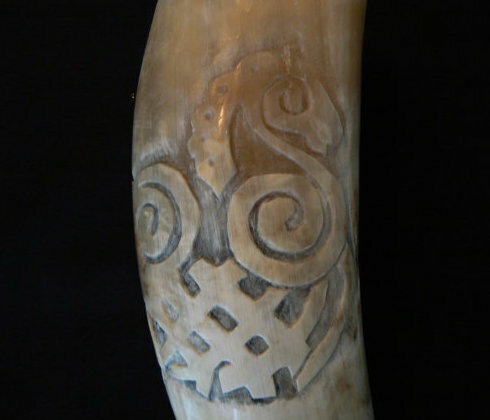 Sleipnir is inscribed into my ritual drinking horn, so given today's events, I feel Loki enlivened and empowered my ritual drinking horn (and the mead within it) for its purpose at my first blót . First, my handcrafted Asatru blót bowl, oath ring and blót altar came today - IN TIME FOR MY FIRST BLÓT! on Thor's Day filled with an all day thunder-rain-lightning storm! Is that not so WYRDLY COOL or what!? So, even though I had planned on another day, I did my first blót today, incorporating into the Hleifblót my Troth-claiming rite, Sacred Name-claiming rite, a blót to Hel, Loki and Thunor specifically (plus to all of the gods and goddesses together) and ritually blooding my three sets of runes (Elder, Younger and Anglo-Saxon). I used my bottle of premium black honey mead (originally designated to be used in a blót specifically for Hel) for this first blót - I couldn't get the cork out the bottle of the premium regular honey mead I had planned to use. Ok, so Hel wants her mead now, I thought - I can do that. 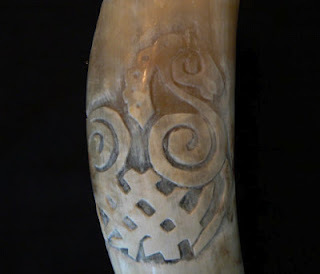 Loki attends Heid's troth-claiming, name-claiming, rune-blooding first Hleifblót. Yes, indeed, the fire giant was in attendance. I was so caught up in the act of blooding my runes (as while doing it, I was listening to Songs of Yggdrasil by Freya Aswynn) that I hadn't even noticed that the flame of my Troth candle (out of all of the candles I had burning, including a candle for Hel - all of which I made) had burnt through the side of the wax pillar, the flaming wick had rolled out, and was lodged in a puddle of burning wax and black leather between the backboard of the altar and the candle holder. I noticed only after candle wax had flooded my altar (I cleaned it up before taking this photo of the burned area). Now, since this never happens to me normally, most people might think this a bad sign, but not me. I see it as a very good sign - Loki most definitely attended my blót and rune-blooding and wanted me to know it. I think it's particularly noteworthy that the altar's runes were burned as I was blooding my runes. Loki himself has blessed my runes! Also, how crazy cool is it that even my harrow itself has made a blót - and the mark of its blót is a sign of acceptance by the deities and wights of my folk. After the blood on my runes dried, I put them all back into their respective bags. Then from each bag, I drew a rune, to ascertain the runic energy brought down into ritual via the three deities I called upon specifically to attend - Hel, Loki and Thunar. Those three runes are shown in the photo. 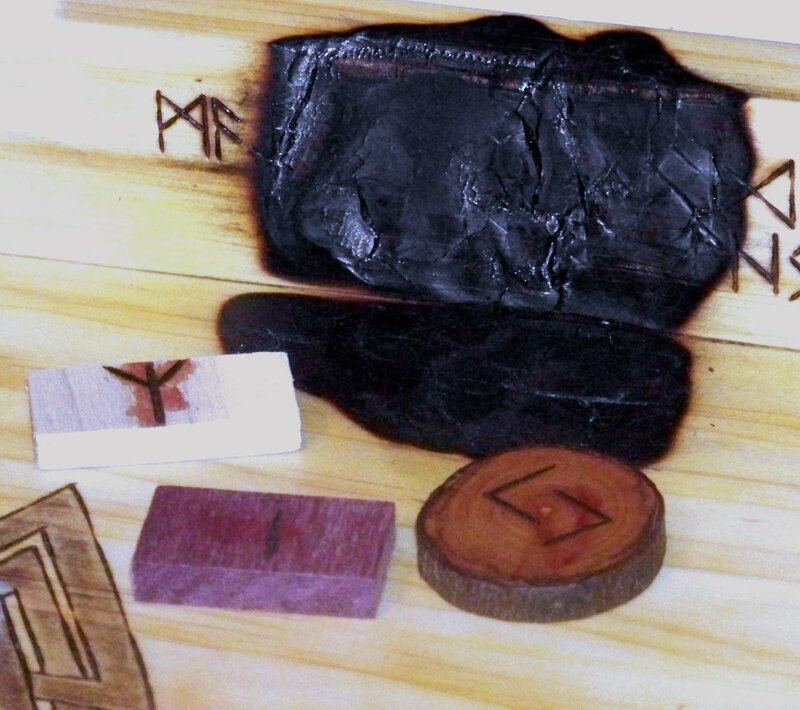 All three of these runes are in Hagal's Aett, the middle Aett. Hagal is the Old High German for "hail." And so begins my Sacred Name in Troth - Heid. Matches to my basic motherline haplogroup U5b1b in the Mitosearch database turned up heavily Finnish, with 22 matches. Matches for Scandinavia totaled 25 (Finland 22, Norway 2, Sweden 1). There were only 3 matches from the British Isles (England), 2 from Western Europe (Germany), 2 from Eastern Europe (Poland, Slovenia), 1 from North Africa (Algerian Berber tribe) and 1 from Western Africa (Fulbe tribe from Senegal). Both the Berbers and the Fulbe tribe from Senegal are unusually linked with Scandinavian Saami U5b1b in scientific research literature. Here are three full sequence motherline mtDNA matches for me that I have found in two databases, one at Family Tree DNA and another at mtDNA Community. These three individuals are identified to be in my very specific motherline haplogroup U5b1b1-T16192C!. At least two of the three matches are "4 steps away" from matching my own mutations exactly - none of these individuals carry all seven (315.1C 522.1A 522.2C A12366G A13911G T16093C C16519T) of my "private extra mutations". The match at Family Tree DNA does not report differences in the match results, so I don't know how many "steps away" the UK match is from me. Anyway, from these three individuals who match me (as it pertains to ancestral genetic motherline) more closely than anyone else in the world so far, it looks like my motherline originates most precisely from Sweden and the UK; where likely the ancestral U5b1b1 pan-clan for both of the two modern regional populations (where my European matches are found) found refuge among the Berbers during the height of the last Ice Age. Scientific population genetic research has demonstrated that Scandinavian U5b1b1 tribes found refuge among the indigenous North African Berbers during the last Ice Age when Northern Europe (including most of the UK) was covered by glaciers. With my "extra private mutations", it is very likely that, as more people in various European populations get genetic testing done (adding data to the databases), and others in the U5b1b1-T16192C! haplogroup are found who share my unique mutations, the origins and migrations of my motherline will be even more precisely identified. Identifying the European regional origin of my "private mutations" will provide more insight as to my motherline ancestry. My extra mutations could have arisen anywhere in Europe, but given that oral family tradition is that I am of English, Irish and German ancestry primarily, it is very likely that my extra mutations may have arisen in one of these areas of Europe during more recent historical (or late prehistorical migrations) of my motherline. At any rate, from all that I've learned so far, my deep ancestry seems to be Scandinavian (Sweden), with migration of my Clan during the Ice Age into North Africa, followed by a return to Europe following retreat of the ice sheets, when then, members of my Clan may have re-settled in both Celtic and Nordic areas of Europe (i.e., Northwestern Europe generally). In compliment to a post earlier this year reporting my genetic motherline mtDNA (HVR-1 and HVR-2) matches in the database from Roots for Real, here are my genetic motherline full sequence mtDNA matches (HVR-1 only; HVR1 and HVR-2; and HVR-1, HVR-2 and coding region) in the database of Family Tree DNA. These are motherline only results. (In Voluspa) the name is translated as 'bright one' and within the stanza, Heid, the prophetess is telling her story. She starts her tale before this point "as far back as it is possible to go" with the story of creation. This allows us to understand that she has access to information that forms the very existence of the universe and is beyond the capabilities of her mortal life to be in memory of. Another theory, of course, is that the prophetess is older than time and is therefore seen by Odin and by mankind as immortal, ever present and ever knowing. As the Ancestors are timeless and immortal, so too is the immortal Heid an active remembering extension of the Ancestors into mortal Being. I've on the right spiritual path for me now, my dreams are proving it. Until the past few weeks, over the past several decades, I've had dreams with my kids as young children in homes full of elemental chaos that I could barely control, with doors broken or not functioning correctly and other things. Last night (early this morning actually), I had a dream of moving into a big old beautiful and stately home. My children and I were putting everything neatly into order, no chaos at all. Nothing was strewn around (with me stressfully trying to keep everything picked up like in the chaotic dreams). Everything was clean, neat and nice. Nothing broken. The old house was well kept up and beautiful. The owner of the house was going to put in a vent in the kitchen above the stove which had been covered over previously. My kids were well behaved and helping me get things arranged the way I wanted them. Everything was just perfect. My eldest son was now a teenager, and I was going to trust him to take my car to the store for some paint to paint the lowest frame of the outside front door where a visitor's child had drawn in red on it while we were moving in - the only thing out of place in the entire dream. Life was good and getting better! This is an excellent dream. I am in control of the chaos and it has been transformed into a lovely order. I loved the stately old house we had moved in to. It was just perfect and the most lovely home on the street. This is the Eurogenes K9 chromosome painting of my population percentages. Look at all that blue Northern European! Uploading my FTDNA autosomal (genes inherited from both parents) SNP genetic data to Gedmatch, I ran the data through the Eurogenes K9 Chromosomal Analysis Utility. This Utility reports that my chromosome 16 has 85% Northern European genes. Chromosome 12 has 80% Northern European genes. Chromosomes 9 and 10 have 79% Northern European genes. Of all of my chromosomes, only 21 and 22 (the two smallest human chromosomes) are less than 50% Northern European. Chromosome 21 is the smallest human chromosome. Chromosome 22 is the second smallest human chromosome. Uploading my FTDNA autosomal (genes inherited from both parents) SNP genetic data to Gedmatch, I ran the data through the Eurogenes Hunter Gatherer vs. Farmer Utility which calculates genetic prehistoric ancestral population percentages. Shown are my results (top image) and a map (bottom image) showing the regions the results refer. This utility calculates that I descended from prehistoric Baltic Hunter Gatherers (55% - In prehistoric times, Finno-Ugric tribes inhabited a long belt stretching across northern Europe from the Urals through northern Scandinavia), Mediterranean Farmers (34%), Anatolian Farmers (7%) and Middle Eastern Herders (3%). More info on the utility HERE. "If you're looking for a fairly clean cut summation of your ancestry, then use the results from K9 or the Hunter-Gatherer vs. Farmer tests, where genetic differentiation between the clusters is greatest." Uploading my FTDNA autosomal (genes inherited from both parents) SNP genetic data to Gedmatch, I ran the data through the Eurogenes K9 Admixture Utility which calculates genetic admixture population percentages. Shown are my results (top image) and a map (bottom image) showing the regions the results refer (North Amerindian is not shown as my score for that region was 0%). This utility calculates that I am basically 65% Northern European, 32% from other areas of Europe (including the Caucasus) and 3% from Southwest Asia (including Middle East). These videos explore the ramifications of the the Paleolithic Continuity Paradigm and how it reflects on modern reconstructionist Neo Paganism/Neo Heathenism. Two parts, second part linked in comments.